Philippines is now facing an increasing rate of unemployment everyday. It is a fact announced daily on TVs and printed media which is a result of Economic downturn worldwide. But despite the hardships, Filipinos’ character of patience and hardwork will always emerge because Pinoys are natural survivors. There maybe a decreasing demand on wirings, computers, electronic and other related industries but a number of identified skills are still in demand. One of thriving opportunity for Filipinos abroad is the Welding Industry. The Demand for this specific skill is increasing recently. Surprisingly, this is not just a man’s job anymore as for the latest development, women are already starting to try this area. The Philippine Government has encouraged Filipino entrepreneurs to open up welding training centers to cope up with the increasing demands for Filipino welders. In my area in particular, there are newly opened technical school offering welding related courses. Heats School of Welding Technology is one good example. Heats started to hold trainings in 2008 by renting private rooms. Most of the participants are now working abroad. The good man behind this project is Engr. Pedro Jose Jr. He is a native of Kapanikian, Lapaz, Tarlac. He has been in the field of Welding, QA/QC and Inspection for the past 14 years in the Philippines, Kingdom of Saudi Arabia, Qatar, Indonesia and Brunei. His Noble Mission for the School is to produce World Class Pinoy Welders, Welding Inspectors & other skilled workers. 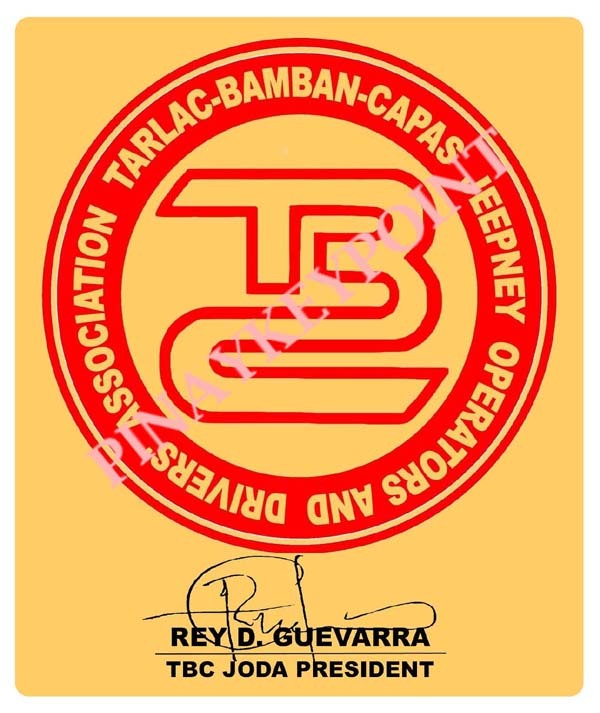 To realize this mission, he turned his home into a Technical School to help not only his fellow Tarlaqueño but his fellow Pinoys from adjacent areas as well. Heats School of Welding Technology is now in the process of TESDA Accreditation and according to TESDA personnel, their accreditation documents will be released this February 2009. HEATS’ building, classrooms, facilities (such as Welding booths, working table and grinding table), welding machines, tools and materials are now in place and ready. 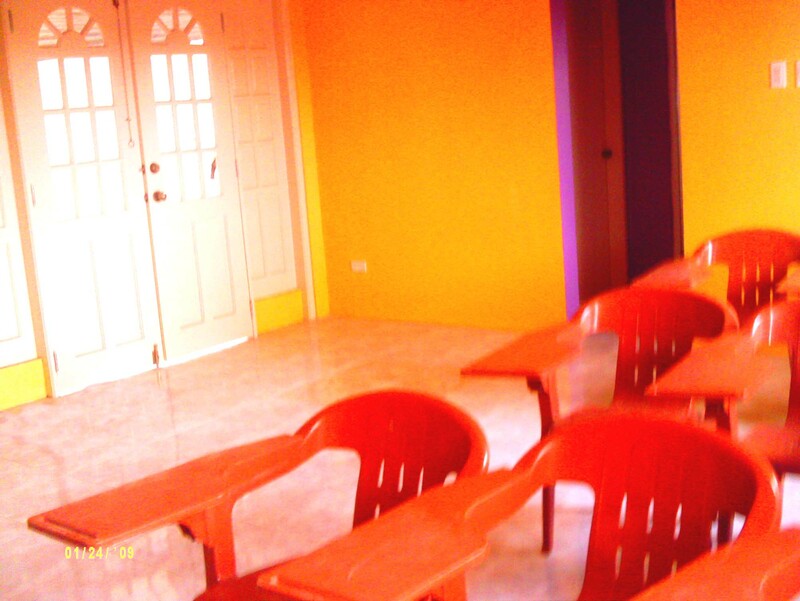 Pictures below are the proof of Mr. Jose’s humble attempt to turn this project into reality. SMAW Plate, SMAW Pipe, GTAW Pipe and welding Inspector’s Course. They also plan to offer NDT Courses such as Utrasonic Testing, Penetrant Testing and Magnetic Particle Testing. Internal Quality Auditor’s course and ISO 9000 Awareness Seminars and other related skills are also in included in their line of courses that will be offered in the future. 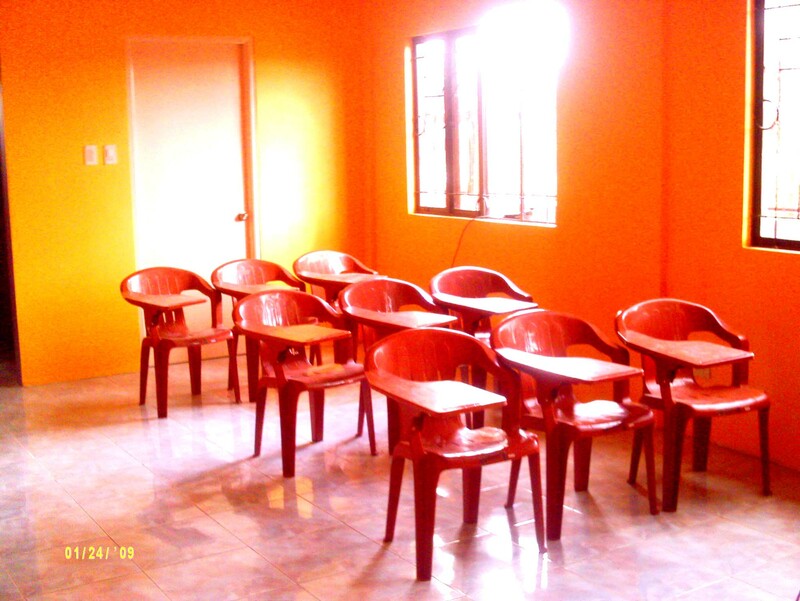 They will be accepting enrollees in February and plan to start classes on March 2009. For inquiries and detailed information, you can visit their website at http://heatsschoolofweldingtechnology.wordpress.com/ or you can email them at pwtc_luzon_@yahoo.com . 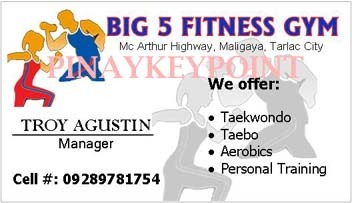 You can also reach them through mobile phone: +639054104465 or you can also personally visit their School at Romulo Highway, #4 Joanne Subd., Canrangian, Tarlac City. Staffs are available for inquiries during office hours. For detailed description of Welding principles, Welding Trainings & courses, terminologies and job opportunities, please visit Heats website by clicking here. OMG! I am more than a week late. It’s October 9 and I never make a single post yet for October. I would like to thank oDesk team for featuring my blog in their September Newsletter. I am excited for the oDesk T-shirt that you sent me. To give you an idea about the shirt, I included it in my post. It’s not in my possession yet as oDesk team just sent it the other day. I guess I need to wait for a couple of week before I receive it. Once again Thank you oDesk Team! You guys really rock! and I am proud to be a part of your growing family 🙂 Two Thumbs Up!! Job searches for Tarlac always goes to my landing pages. I’m sorry guys that you can’t find Job Posting in my blog because I don’t have contact with the establishments here. I’m just a typical mommy working online and homebase. Most of the events in Tarlac that I am featuring in my blog are the activities that my kids attended. They are the one who gather data and photos for those events. 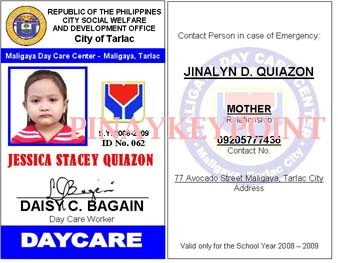 Please check our local website at http://www.tarlaccity.gov.ph/local_employment.htm. They are also posting current events and job vacancies. But if you have writing skills and you want to work online like me, I can give you tips on how to start. Just leave a message in my comment box and we can PM. Thanks for the regular readers of my blog, you’re always in my widget, gorgeous faces 🙂 I really appreciate it. There’s a scarcity of job in the first world. Not because they have economic problem but because companies cuts costs and opt to outsourcing and offshoring. If you do a company hopping you’ll find out that within huge buildings and establishments are just a few numbers of employees. This is not good for the workers and job seekers but for us who lives in the third world country, we find it helpful since we are given an opportunity to compete and prove our worth. I am one of the many Filipina freelancers working online. I do most of the work during night time when my kids are already in bed. Most of the time I am writing till dawn to meet deadlines. 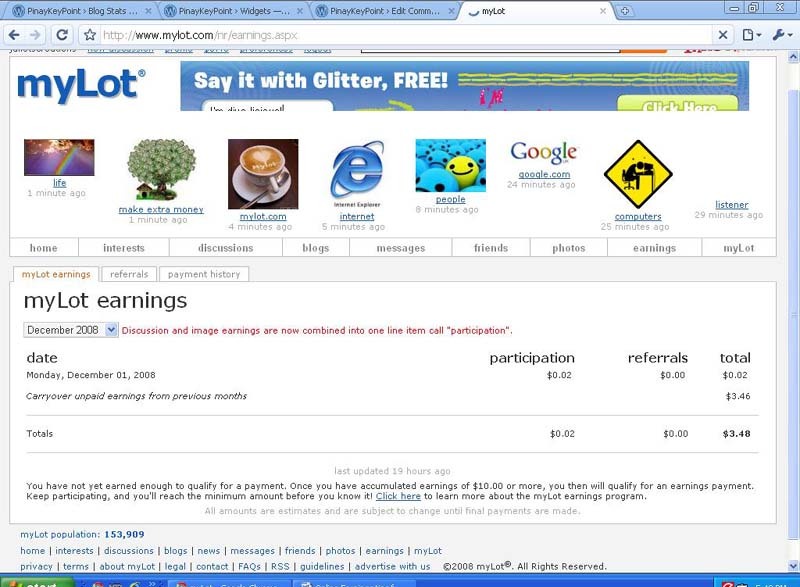 I joined many websites for freelancers and started bidding jobs at a very cheap price. After sometime, I found employers who pays reasonable price. 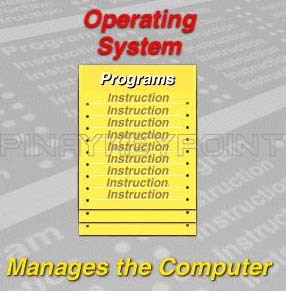 One of the companies who hired me is devbook.com. I am writing fun quizzes and I really enjoy the job. But working online cannot be a main source of income. It is only an extra income where we can have an extra budget for family expenses. I still run a family homebase business wherein we can have fix earnings on daily basis. Running a family of four kids is not easy and there are times that we are really on a tight budget and needs extra cash for unexpected expenses. 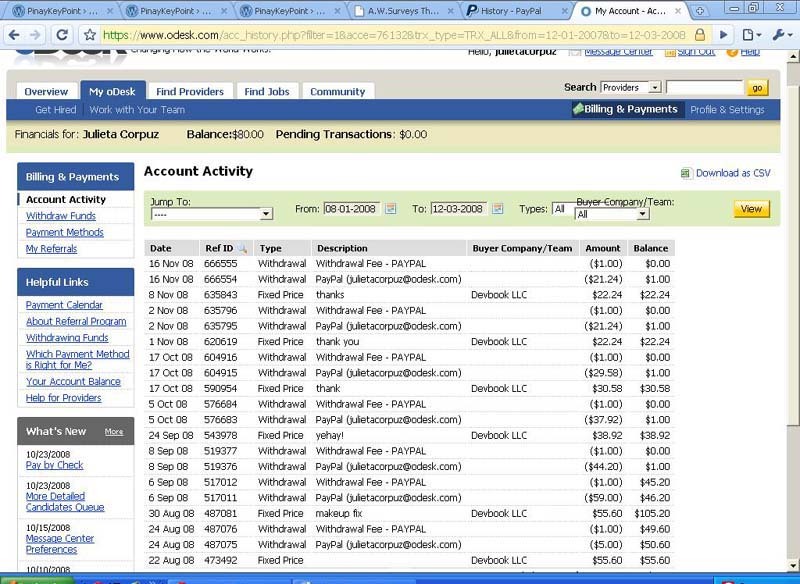 When we are in the midst of crisis wherein we need additional fund, it’s good to know that there are financial institutions that we can run to and I will mention at least 2 in my lists, fastcashonline and pacificadvance. They are reliable if you are in need of cash advance during emergencies. Today is Maintenance day for me. 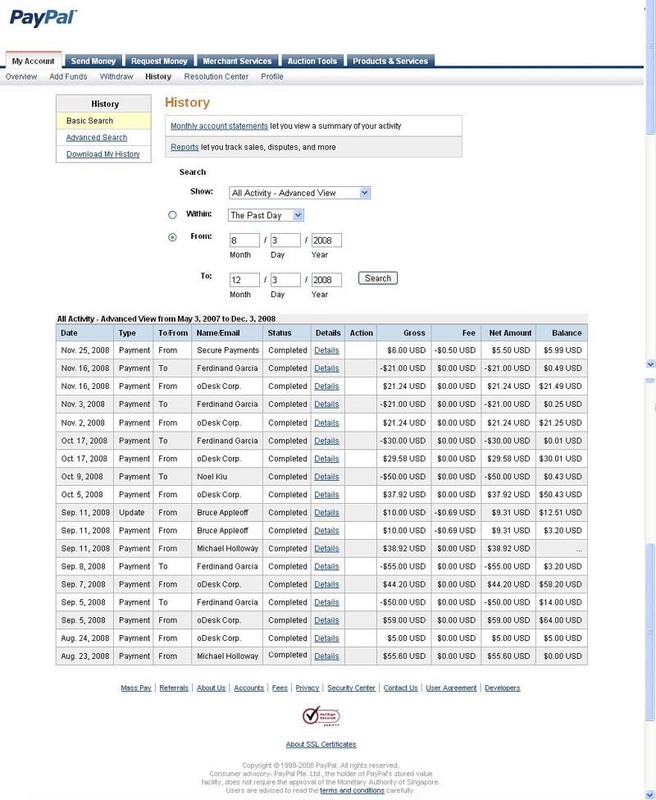 This is my schedule to log to my accounts, blogs, client’s websites and other club memberships. I am doing this once a week, but I’m checking my mails on daily basis. Currently I am writing entertaining quizzes for devbook.com which is posted at boredquiz.com. I posted some of the links of my quizzes in here and you can find it in my fun quiz page. When I checked my account at boredquiz, I was amazed by the result of one of my quiz. It’s on the top lists. I am very pleased and of course proud that among the thousand quizzes posted at bored quiz, I managed to be included in the top ten and the amazing part is that it was taken by more than 40,000 and still counting. What’s the title of the quiz? What female Naruto Character Are You? This quiz is conceptualized by my eldest daughter, Jessica since she is an Avid fan of Naruto. She has vast collection of Naruto pictures and many more. I scolded her for that habit since she was in her grade school and now that she’s in Junior high, her fondness for Naruto never ceased. She’s still at school and I know she will be glad to know that the quiz that we created is in the top list. If you’re a Naruto fan and you want to try the quiz, just click here. The results will be nice looking female Naruto character pix which you can imbed in your blog, website, facebook or myspace page. You must have a credit/debit card with Visa or MasterCard logo. If you don’t have a credit card, I recommend that you apply for a CyberEon card. The last time I checked, it only costs 350.00Php (Annual Fee). You can apply online or visit Union Bank branch near you. 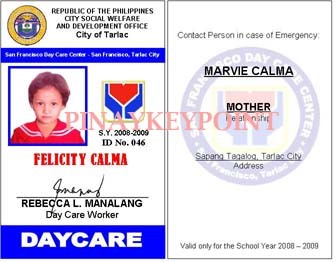 Bring 2 valid IDs and picture and also photocopy of your 2 valid IDs. It will take more or less 2 weeks before you receive the Eon card. Deposit an amount equivalent to $1.95 or maybe at least 200Php to your Eon Card. This will be used for PayPal verification but will be returned to you after you are verified.Your card will be activated within 24 hours. You can also enroll it in Union Bank online banking. After activation, you can link your Eon card to your Paypal account. The CCV code is the last three numbers at the back of your Eon card. Once you retrieved your PayPal code, log-in to your PayPal account and click “confirm my debit or credit card” link on the Account Overview page to enter your code. 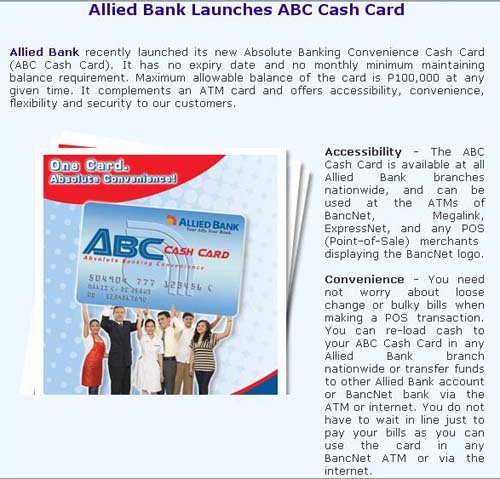 After Verification Process, you can now add another bank account and withdraw from any Philippine Bank Account. Your First name and Family Name on your PayPal account must match the name on your bank account, if it doesn’t match, your withdrawal request may be rejected by your bank. Add your Bank Code. 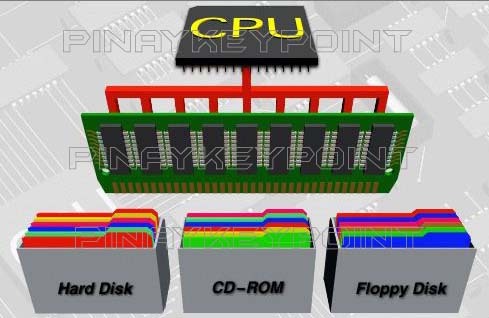 Bank codes can be found in my previous post. Withdrawals equal or more than PHP 7,000 are free. 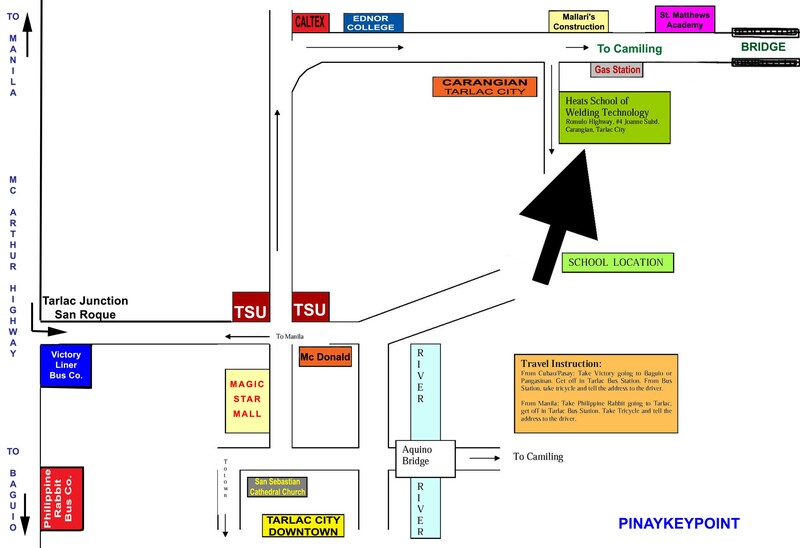 Camp Aquino Learning Center (CALC) is a pre-school located inside Camp Servillano Aquino, San Miguel, Tarlac City, Philippines. 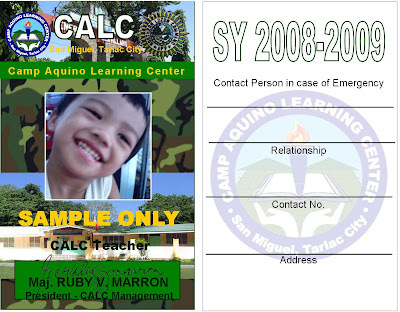 CALC is managed by Northern Luzon Command (NOLCOM) Management. To date, it has 50 students and still counting, divided into 3 sections, Nursery, Kindergarten & Preparatory. CALC is closer to my heart as this is where my kids had their preparatory education. The place is cool and safe as it is situated inside a military camp. It has beautiful field and & playground surrounded by trees. Below are some pictures I’ve taken to show the place, the camp & the school. 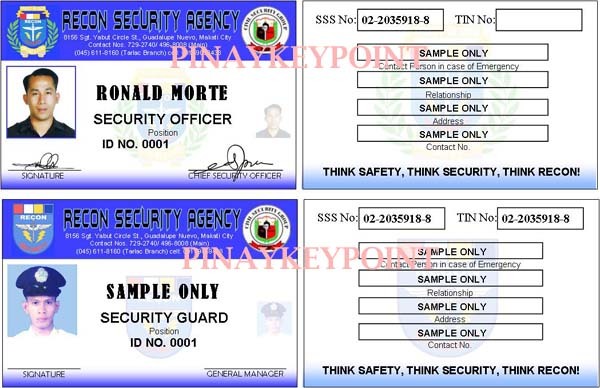 This is my sample design of their ID. It’s not final yet and still under negotiation. 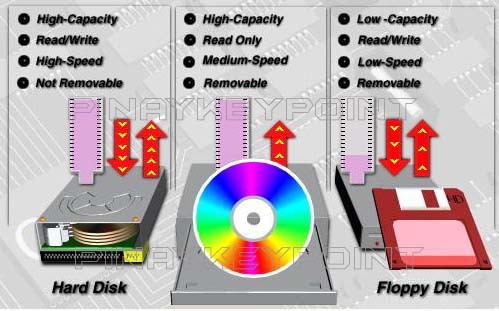 NOLCOM Management has to approve the design. 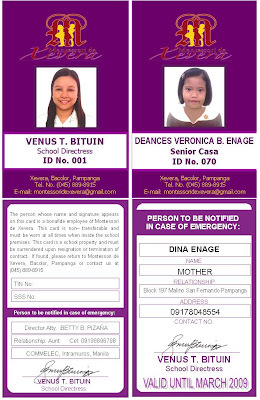 We bagged the contract for Biometric System in Montessori de Xevera, Bacolor, Pampanga. 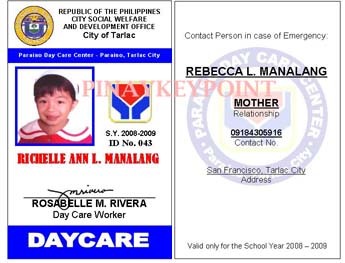 The project includes Identification Cards (ID) for pre-school students and faculty. 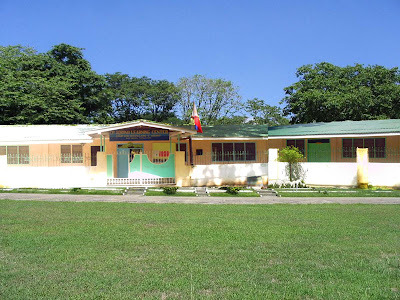 Montessori de Xevera is one of the most advanced pre school in Pampanga equipped with the latest interactive instruction materials, computers, advance modules and professional faculty. Montessori de Xevera is one of Mr. Delfin Lee’s prides. Mr. Delfin Lee is the President and Chief Executive Officer of Globe Asiatique, builder of the sales record-breaking Xevera community in Bacolor, Pampanga. Mr. Delfin Lee is the same guy you see so many times on television giving out condo and residential units to winners in “Pinoy Big Brother”, “Pinoy Dream Academy”, and “Wowowee”. Globe Asiatique is the same group behind GA Twin Towers, Edsa Mandaluyong; Chateau Valenzuela, a 5-star condo complex in Valenzuela City; Sta. 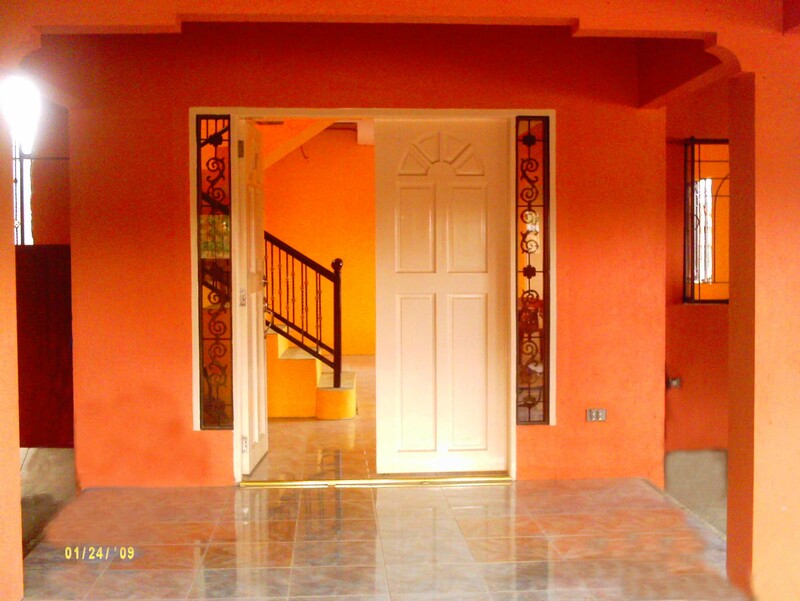 Barbara Villas, a modern community overlooking mountainside of San Mateo, Rizal; and St. Monique Valais – a 200-hectare classy residential area in Binangonan, Rizal. Busy day!! Enrollment @ Montessori de Xevera School. 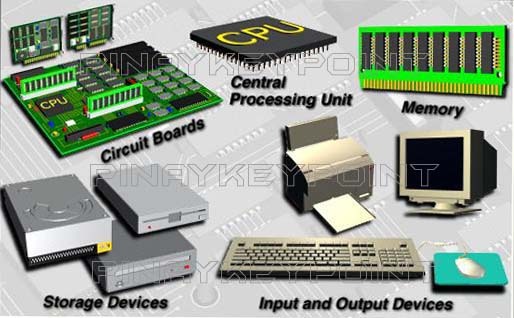 Taking Pictures for ID and fingerprint for Biometric System. With me is Sir Bong Gallo, my Project Associate. With me is Liza & Robin, My Project Associates. This picture was taken infront of Xevera Elementary School.